In their suit, the firm contends bison must be allowed to move north into the Paradise Valley. According to the Bozeman Daily Chronicle, the Cottonwood Environmental Law Center filed the suit partially in response to the influx of more tribal bison hunters to the region, which, along with hazing, could constitute a public safety hazard. 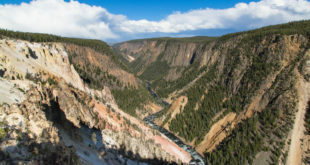 John Meyer, an attorney and the director of Cottonwood, said the lawsuit is about allowing bison to migrate past the northern tolerance boundary, which is set at the mouth of Yankee Jim Canyon. He thinks that could alleviate safety concerns at a congested bison hunting area near the park border, where dozens of hunters wait for bison to cross onto Forest Service land. Meyer initially filed the suit earlier this month and asked for a temporary restraining order to prevent state officials from enforcing the northern tolerance zone. U.S. District Judge Sam Haddon rejected that motion. Meyer filed an amended complaint this week that included additional claims. The Montana Fish, Wildlife and Parks agency is reviewing the Cottonwood complaint, according to the Chronicle. Further, spokespeople from Yellowstone, the Department of the Interior and the U.S. Forest Service declined to comment, while the Montana Department of Livestock did not return comments before the paper’s deadline. The Cottonwood suit is the latest to be filed against bison management in and around Yellowstone National Park. Another suit, filed in 2016, argues Yellowstone bison should be given protections under the Endangered Species Act. Earlier this month, a federal judge sided with the plaintiffs and called on the U.S. Fish and Wildlife Agency to reconsider protections for Yellowstone bison. Yellowstone bison are managed from brucellosis, a disease cattle mangers fear roaming bison will spread to their herds, although there have been no cases of bison-to-cattle transmission. Elk have, though. In addition to concerns over public hazards, the Cottonwood suit argues bison managers need to reconsider management practices following a 2017 report from the National Academy of Sciences, which shows elk are more likely to spread brucellosis to cattle than bison. Last month, opponents to bison management have argued that cattle managers need to be more proactive in curbing brucellosis, which could include vaccinating cattle against the disease. In response to growing research into brucellosis dynamics and the impacts of bison management, stakeholders under the Interagency Bison Management Plan agreed to redraft the plan and modernize it. As of 2017, the IBMP is stalled on how to change the plan. Although broadly united against bison hunting and slaughter, bison advocates seem split on quarantining, which the park has proposed as an alternative to slaughter that could lead to bison being shipped to other herds around the country. While some view quarantining as more palatable than current practices, others see quarantine as an attempt to domesticate wild bison. These advocates argue bison should be allowed to roam freely on the landscape. To that end, Yellowstone National Park has already seen its quarantine program undermined. January 2018, 52 bison were released from pens in Stephens Creek, some of which had been in the facility since 2016. Nearly all of these bison did not return and Yellowstone did not seek to corral them back. Thursday, February 22, 2018, fences were cut for a second time, releasing over 70 bison being kept there, though the majority of these bison returned before crews repaired the fences. In light of these fence cuttings, the park has announced it will increase security around Stephens Creek, although officials did not describe what this would entail. The park also announced it had over 350 bison in Stephens Creek, following Thursday’s breech, and anticipates keeping some of the bison in quarantine. Montana State Veterinarian Marty Zaluski also announced he expects Stephens Creek to become a certified quarantine facility sometime this upcoming week.